Have you ever wondered what 2,000 calories looks like? When we eat, especially our favorite foods, we usually don't think about the caloric intake. Instead, we just pile the food onto our plate and enjoy its deliciousness. But, by recognizing how many calories we are eating each day, we can maintain our weight and keep ourselves fit and strong. 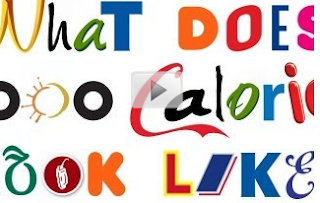 Take a few minutes and watch this short film and see if you are eating more than your recommended calories each day.